Let's take a quick trip down memory lane back to school, shall we? My school years weren't so long ago so I can clearly remember them. A task that I didn't like much during class was taking notes. Flawless note taking is practically impossible to achieve. The teacher could explain a lesson quickly and you don't have time to get in all of the key points necessary. You have to end up abbreviating your notes to make sure you capture everything important. Wouldn't it have been so much easier to have a pen to record extra important details from notes? I know I would have loved that! Livescribe smart pens digitally capture everything you hear and write, allowing you to simply tap your ink and play back everything you recorded at that specific moment. The Sky wi-fi smart pen wirelessly syncs your notes and audio with your Evernote account, making them immediately accessible on your computer, smartphone, tablet, or the web. When paired with your mobile device, the pen offers the natural feel and precision of writing on paper with the advantages of viewing, sharing, and saving handwritten notes on a tablet! This is the perfect present for a college or high school student especially around exam time. Don't forget those office employees too! 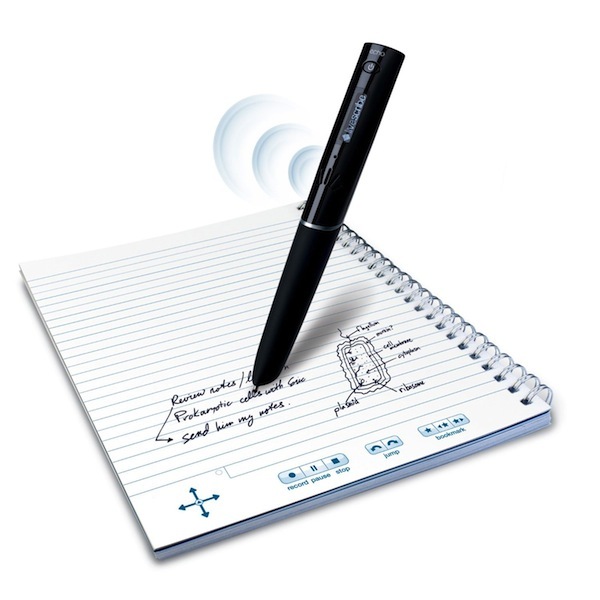 The smartpen would come in handy during a meeting or any other time notes need to be taken. The pen is small and compact enough to fit in a purse, a brief case, a locker, or even your car. I chose to give this pen to my fiance because he's in graduate school at the moment. He's constantly taking notes and wants to be as clear and concise as possible. He's been nothing but happy with the pen since receiving it. The pen is chunky but still easy to hold and use, he tells me. The black hue is modern and stylish. The pen ink also flows well and is consistent when he writes. The pen is definitely a lifesaver. He really likes being able to record specific key points, notes, and diagrams that go directly to his Evernote account online. If you try to write everything the professor says, you're going to miss things. He makes sure to record the extra important notes the professor says, so he has it for reference later. Tap your notes and high quality audio plays back what you just recorded. The pen has an easy-to-read digital display on the front face. An Evernote account is very easy to create and everything you save to the account will be there to view anytime you want. The wireless syncing is very handy as you don't have to worry about forgetting to upload the notes, or even dealing with cords to sync! My fiance says that the smartpen making note taking much easier and less stressful! The pen stays in a zippered compartment in his backpack for easy access. If you're looking for an easier way to manage your notebook or notepad, Livescribe's waiting to help you!